An important activity that you can do as a parent is to encourage and participate in your child’s pretend play. Every area of development can be enriched with pretend play. Here are some fun ways that this kind of play engages children in essential life and personal skills, as well as increases their knowledge of the world around them. Research has found that children who participate in pretend play benefit in a variety of ways. Empathy: Children show higher levels of empathy and compassion because pretend play helps them practice putting themselves in another person’s shoes. Overcoming fears: Dramatic play experiences can also help children learn how to cope with something that they fear or have anxiety about. 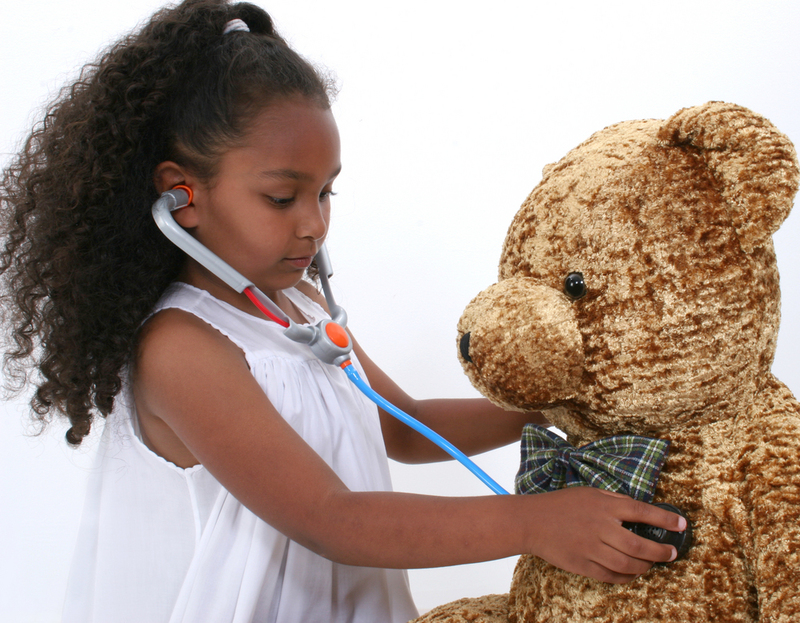 A child who is fearful of the doctor may role-play in order to become more at ease with a situation that is out of their control. Pretend play helps children understand the power and importance of language. During imaginary play, you often hear a child repeat words and phrases that you, or other adults, have said to them. Playing with language and learning rich, interesting words strengthens a child’s vocabulary development which, in turn, is a strong predictor of future literacy skills. By encouraging dramatic play, parents help children develop fine and gross motor skills. A focus on hand-eye coordination and visual skills will later aid in reading and writing. Free, unstructured pretend play is vital for developing problem-solving and reasoning skills. Dramatic play encourages children to use imagination by acting out familiar scenes. This ability to think symbolically and creatively is the precursor to all future literacy and math skills. There are a variety of ways that you can promote pretend play at home. Effective toys: Offer simple, realistic toys , such as play kitchens, dolls, tool benches, shopping carts and food. Costumes such as doctor scrubs, firefighter and police uniforms, mail carrier, waitress and pilot uniforms. Cardboard boxes also encourage rich dramatic play. Loud, stimulating toys can stifle imagination and creativity. Expressing through puppets: Provide dolls and puppets for your child. These toys allow the children to explore and express their own feelings. Create a box of props. Boxes can contain themed materials. For example, you may have a veterinarian prop box with a lab coat, stuffed animals, stethoscope, bandages, and any other props you may have that could be found in a veterinary office. Costumes: Allow your child to experiment with different costumes and avoid over-emphasizing gender roles. Take your time: Perhaps most important, make sure you spend time interacting with your child. While independent play is important, there is no substitute for the knowledge a child gains from interacting with a parent. Young children learn by imagining, playing, and doing. So when you see your child riding a pretend pony and wrangling up stray cattle, grab your cowboy hat and join in!